You can assign Jobs and Tasks to specific Employees, or assign specific Tasks to specific Jobs easily in ClockShark from the Add Job and Update Job Screens. To limit which Employees are able to clock in to a specific Job, you'll set the Access Control feature when adding the Job. This feature can also be set after adding the Job, by editing the Job from the Update Job Screen. You can Allow Everyone, or Allow only specific Employees access to clock in to the Job. To specify which Tasks are available to the Job, find the Task Control Section on the Add Job/Update Job Screen. From the Task Control on the Job you can Allow All Tasks or Allow Only specific Tasks. 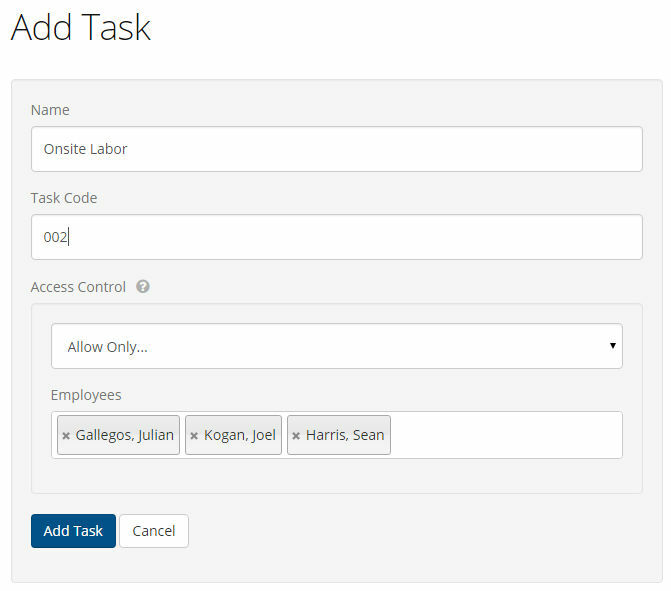 You can also set specific Tasks to be accessible only by certain Employees from the Add Task and Update Task screens. Note- This feature requires Employees to have version 2.2.7 of the mobile app or later.